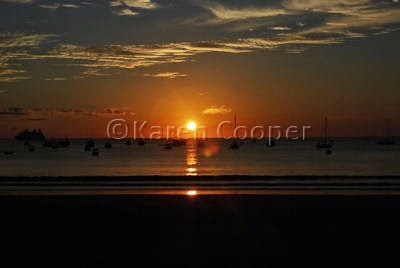 San Juan del Sur, Nicaragua offers up some pretty awesome, not overdone sunsets. The kind that make you stop for a few moments during your mad rush to do whatever and just look ... and let Mother Nature work her healing charms on your frazzled nerve endings. I have never seen the "green flash" sunsets that so many people talk about. I think if you have enough cocktails in the evenings, you could make the flash any colour you want it to be. But I understand this is a very real phenomena. The green flash, not the cocktails. San Juan del Sur has become a mecca for surfing over the last decade or so. Apparently the waves here are like no others in the world. I am finding that out about the whole of Nicaragua. There are places here that defy imagination. And are like no other places on earth. Such immense beauty makes me want to stop for a few moments and let Mother Nature work her healing charms. Maybe I'll even see the green flash. Are they talking about the "green flash" down there too? I have never ever seen one here in Key West. Neat blog! I'm glad to know of it. The first time I heard of the green flash was in Arthur C. Clark's 2010: Odyssey 2. I've met quite a few astronomers over the years and none of them have seen it. So neat. I have never even heard of a green flash. Must be one of those once in a lifetime things.